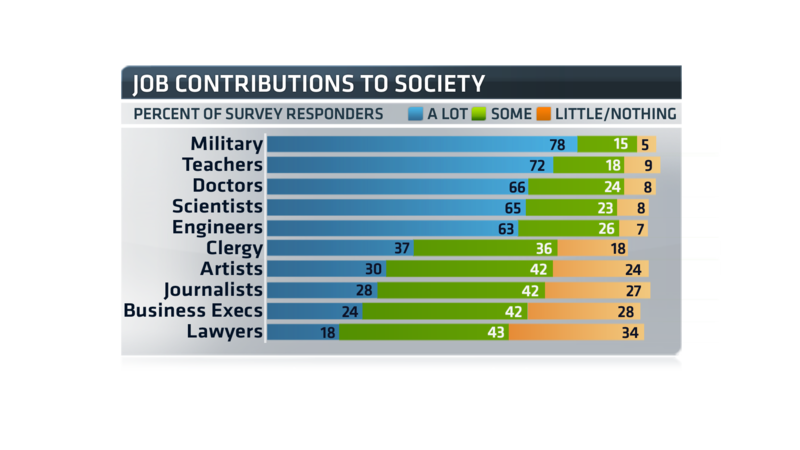 Lawyers and business executives are among the least trusted occupations in America, and members of the military, teachers and scientists are highly regarded, but Americans are split on just how much those groups contribute to society, according to a recent survey. About 24 percent of 4,006 adults polled from across the country by the Pew Research Center said business executives contribute "a lot" to society's well being while 28 percent say executives contribute little to nothing to society. The difference is much more dramatic when it comes to perception of lawyers, however. Only 18 percent of those surveyed said lawyers contribute a lot, while 34 percent said lawyers contribute little to nothing to society, according to the Pew Research Center. Pew specifically asked about the perception of ten occupational categories and how much they contribute to society, according to Cary Funk, senior researcher at the Pew Research Center. "The wording of the question definitely makes a difference in how people respond, but what's interesting about this is you can compare it to other surveys done by other organizations that use different wording and you tend to see a similar relative ranking of these occupational groups," Funk said. Among the more highly-regarded occupations, more than 70 percent of those surveyed said members of the military and teachers contribute a lot to society, according to the study. And scientific fields ranked highly. 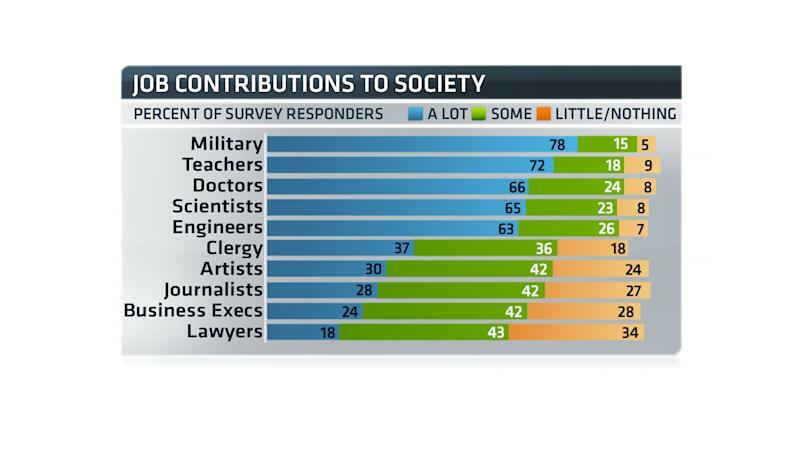 More than 60 percent of those surveyed said medical doctors, scientists and engineers contribute a lot to society, while less than 10 percent said each group doesn't contribute much or contributes nothing at all, Pew reported. "What is perhaps most striking about this list is the paradox that exists between public perception and career pursuit. The occupations that are most esteemed are also the ones that too few people seek out," noted John Challenger, CEO of outplacement firm Challenger, Gray & Christmas. “Teachers, scientists and engineers all suffer from labor shortages, a situation that is likely to worsen as more and more baby boomers exit the workforce. Meanwhile, business and law are flush with candidates, with more and more graduating with business and law degrees every year,” Challenger said.